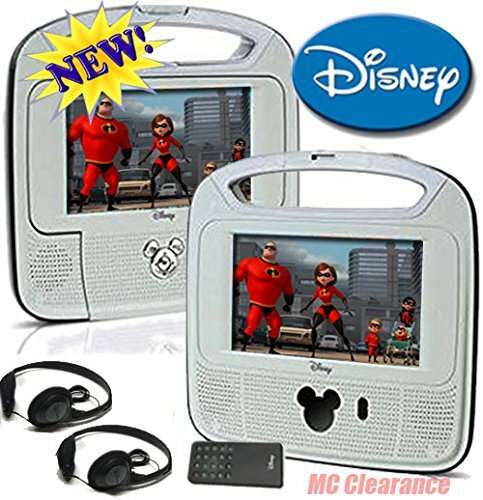 Get ready for convenient movie viewing with the Disney Dual 7" Portable Player. It's an awesome choice for road trips and other personal viewing opportunities. Dual screens let children share the view, so it's a useful tool for families with multiple little ones. This kids' portable DVD player shuts for compact storage, and a handle provides convenient portability. In addition to DVDs, this item also plays CDs with music or pictures for added fun or even road trip sing-alongs. Built-in speakers provide sufficient sound quality. Parental controls give grown-ups increased say over what children view. It hooks into standard vehicle outlets with a DC 9V-12V input. Durable construction ensures this item can stand up to long-term use. LCD screens provide crystal clear visibility. This Disney portable DVD player comes with two Fairies and two Pirates inserts for easy personalization. Built-in speakers, Parental controls with FREE Bonus DVD!